A new discovery has atheists nervous. This discovery may add further validity to the Gospels in an academic sense. For decades, atheists, skeptics, and some scholars have cast doubt on the Gospels. This doubt would eventually lead to the conclusion that Jesus Christ is nothing more than a myth or a story created in the 2nd or 3rd centuries. 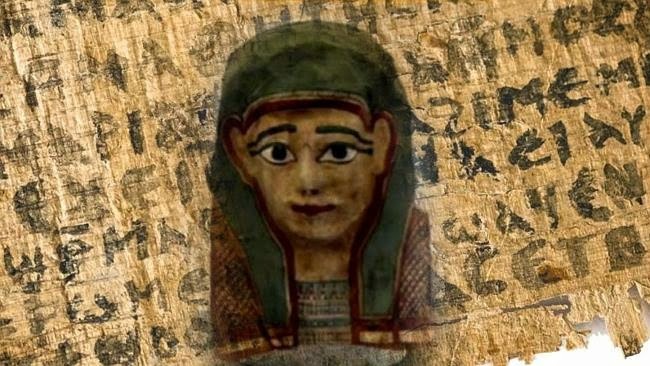 In Egypt of all places, a funeral mask made of (papyrus) paper was discovered to have a fragment of the Gospel of Mark. Why is this significant? Well, the fragment is said to date from the 1st century or 80/90 AD. The Gospel texts available now are of the 2nd century. This time discrepancy is one of the reasons why atheists and others believe Jesus never existed. Why would the story of someone appear centuries after he/she allegedly existed? Why Was The Fragment In a Funeral Mask? At the time, papyrus was extremely expensive. People recycled sheets that already were used or were written upon. Egyptian royalty had golden masks, but the poor had to resort to using used written paper. Biblical scholar Bart Ehrman seemed a bit upset at the discovery. He took to Facebook to complain that the mask was being destroyed in favor of recovering ancient texts. "Disregard for the sanctity of surviving antiquities..." seriously? Ehrman seems paranoid in his post. What academic would ignore the wealth of texts found in these funeral masks? There so much we can find in them. Scientists have found a way to remove the papyrus and the glue used in a way that does not destroy the papyrus and its content. However in doing so, the mask is destroyed since it is made of this papyrus. Nevertheless, if we continue finding more evidence that Jesus was, in fact, a real person, then this is a good thing. What will atheists have to say now?